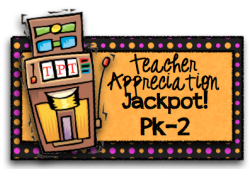 I'm super excited to be participating in the Teacher Appreciation Jackpot for K-2! Along with over 150 bloggers, I will be giving away one FREE product through my TpT store on Sunday, May 6th! 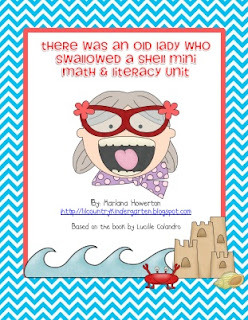 You will be able to download a copy of my There Was an Old Lady Who Swallowed a Shell Mini Math and Literacy Unit!!! The giveaway is ONE day only, so be sure to stop back by! To find out more about each grade level participating, feel free to visit the blogs below to find out more about giveaways that are relevant to your grade level. Also, my TpT and TN stores will both be on sale during Teacher Appreciation Week! Holy Moly! I am SOOOOOOOO excited! This is gonna be awesome! This is super duper cute!!!! Thank you so much for making it your free item today!!! I can't wait to use it! Thank you so much! Happy Teacher Week! Thank you, thank you, thank you! And Happy Teacher Appreciation to you too! I'm a new follower. Thanks for the freebie! This is really cute. Thanks so much. We love this series of books and this one fits perfectly with our upcoming ocean learning. We're so glad we found your blog and TpT store through the jackpot today! Thanks for sharing. This is the cutest and perfect to use with my summer Kinder Prep class! Thank you! Thank you so much for the wonderful jackpot gift! I just wanted to let you know how much I appreciate you and your blog! It is definitely one of my go to blogs when I need a creativity boost!